The bikes have arrived, holla. Put everything together, then got out for a track walk with Shane and the Cube team. Headed out to a local restaurant for some local cuisine which consisted of Colombia club beer, a giant piece of pork, bean soup, plantain, rice thingys and a bunch of avocado on the side - would recommend. Every team in town managed to also picked this restaurant on the same night. Early start to the day to jump on an old school bus shuttle (probably still flasher than Jamie Nicoll Adventure’s) with a rack on the top, we picked the day for it! Three buses made their way through town full of riders and bikes. Turns out bike frames are perfect for clearing low hanging foliage. We arrived to a local band playing some lively music, unpacked the bikes, jumped on and followed local legend Rafael Gutierrez around his Grandmothers coffee plantation trails. Pretty cool scene biking around banana palms for the day and being shuttled up the hill. After the last run down Charly (Murray) and I biked back up the shuttle hill. We realised that we are still at 2500m so there was no banter on the way up, just gasping for breath. Got to the top for some beersies and rode the trip home sitting on top of the shuttle bus with Mops (cycle) and Charly. A hugenormous day on the bike, getting in 7 stages of an 8 stage race for practice. Met up with Shane, Mops, Martha and Ella and headed out to get the day done (it was raining, and had been raining a lot throughout the night). The tracks were slippery, but not too bad and manageable on dry tyres. Riding around in a jungle was the hard part as the humidity was pretty intense, and the high altitude made for sweats on sweats. We got through stages 2 through to 5 and then made the liaison to 6, which was a big mish up a fairly steep hill. It started to rain a bit more heavily at the top so I waterproofed up in me GE gear. By now I was starting to feel comfortable riding fast. Halfway down stage 6 there was a steep straight, I asked the marshal there what it was like he said: "ride the line and go fast" (honest). So I went in no breaks and from the top it looked like a good run out, but as I got closer to the end of the straight I noticed the track in between me and the flat runout at the bottom just kind of vanished. I tried bailing and slipped up, literally just sending it to being flat on my face.. this seems to happen whenever I put a fullface on.. Lucky to walk away just really muddy. Finished the day off and headed home for some cleaning. 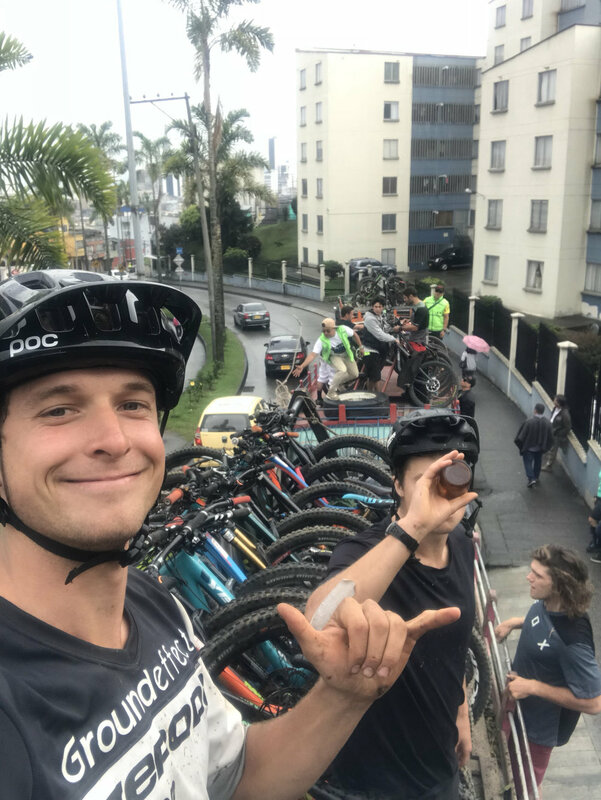 Met up with Ted Morton, Chris Hutchinson, James Hall and Charly for a coffee before heading downtown to practice the Urban Prolog - a race through the streets of Manizales. I have never raced an urban stage before, so even lining up for practise was making me hands sweat. Heading down the course it was a mixture of steps with wide corners then onto roads with hay bails and sandbags to add a slalom of corners to any straight sections. The course was short and not too technical, making it pretty fun. We had 4 hours to chill in between practice and the race, so I biked around a bit of downtown Manizales and tried some local cuisine with the lads. Headed back to the race venue with a bit of panic setting in as the rain clouds threatened to open up. Which they did, luckily only for 5 mins. The roads dried up quick as. I got my race run in nice and safe, and headed home to change the tyres to muds and get some rest. Rain on rain. It was wet. I gobbled down some breakie, chilled out, got ready and biked down to the venue to join the crew for the day - Ted, Loui, and Charly. On the way up to stage 2 (prolog was stage 1) the weather wasn’t actually looking too bad, and then we got the first glimpse of the track and wholly hecka, peoples wheels getting caught in bogs and there was quite a bitta walking/ crashing. We just carried on like we didn’t see that. Stage 2 started out with a run, as it was uphill, boggy but steep so the rest was still rideable, unrideable climb part way down and then the rest of the track was fast and fun with slick sections. I managed to loop out for the crowd in a fast corner. Got to the bottom and felt like vomiting from the altitude for the next 30mins. Stage three, mud mixed with bamboo bridges, off camber straights and paddock. Apart from the run in the middle, this was a fast rideable one. Stage 4 was completely fudged with massive ruts, the best way down was to tripod 90% of it, nobody enjoyed this one haha. Stage 5 was like a bobsled track, 50% was a chute that you could ride at max speed and then finished off with steep off camper corners through pine forest. I scraped the side of the chute in the bobsled section and had a big wipe-out hitting my visor upright and then struggled through the off camber section - I was a squid on this stage. Stage 6 was cancelled heck yeh. Stage 7 was actually fine and had not been damaged that much by the rain. I caught up to Loui and Adam on the final climb and we rode in a train to the bottom, easily the funnest stage of the day. Stage 8 was a 30 second sprint on a grass field with a tiny liason.. Perfect way to finish a big day on the bike. Got down and finished in 66th. Bike wash (gotta get that bike blinging) before heading home to Shane’s place where I had left all my junk for the week, and we started drin… I mean packing bikes which took up the next 4 hours of the night. Rafeal (Gutierrez) came over, and we headed out to the after party. Got home nice and early setting many alarms. Waking up not very long after and unset alarms, then heading back to sleep only to wake up in a panic that we were supposed to be at the airport, but had just woken up. Dragged the boxes and all that out onto the street to catch a taxi. A man at the hotel offered me a ride and we jammed the bike in (which didn’t fit so hung it out of the boot) and he got me to the airport - he called himself a Gutierrez so assumed he was Rafeal’s Dad. Jumped on the plane and got out of Manizales headed back to NZ. Caught up on sleep and the force, with the three new Star Wars movies. I find it funny how they just understand robot beeps and Chewbakas chewbaka noises. Arrived in New Zealand 5.30am with a bike frame, but no wheels.. found out they are still in Bogota, Colombia. Headed straight to BP for a butter chicken pie and three chicken bites :)). Back home catching up on the real world, giant slap in the face. Hella worth it.